No one hits harder — or leaves a bigger impression — than the Seahawks’ thunderous strong safety, Kam Chancellor. Just ask a few of the men left in his wake. Demaryius Thomas saw him coming. They usually do. No one goes very long without looking for Kam Chancellor. And as Thomas sprinted across the field, there he was — the bad man in the dark visor who lurks in the depths of football’s best defense. Thomas had one thought as Peyton Manning let go and Chancellor let loose: Hold on to the ball. He did, somehow, even as Chancellor lowered a shoulder and sent him sprawling. Not that it mattered. It was the Broncos’ first completion, down just 5-0 with nearly 55 minutes left, but for Seattle, Super Bowl XLVIII was already over. Byron Maxwell, only a couple of yards away, had the best view. 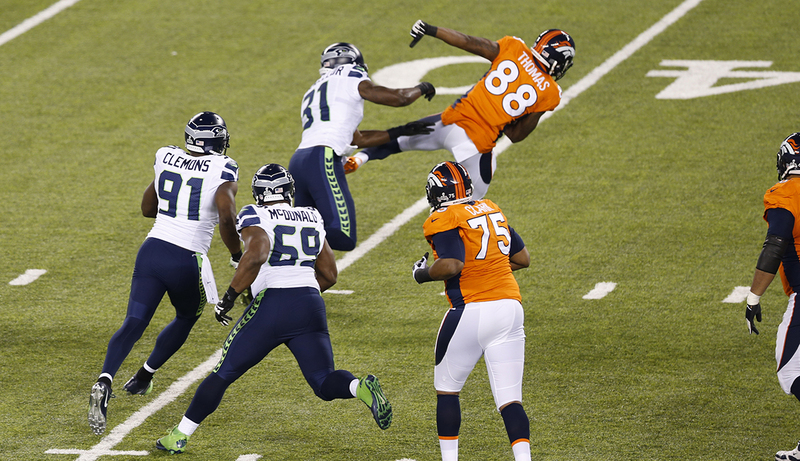 “I was just lookin’ at Demaryius’s face,” Maxwell says, “and I could see that he’d been hurt. I saw a little pain on there.” Earl Thomas leaped into Chancellor’s arms. Richard Sherman slapped him on the helmet. There’s no single reason for Seattle’s success on defense. 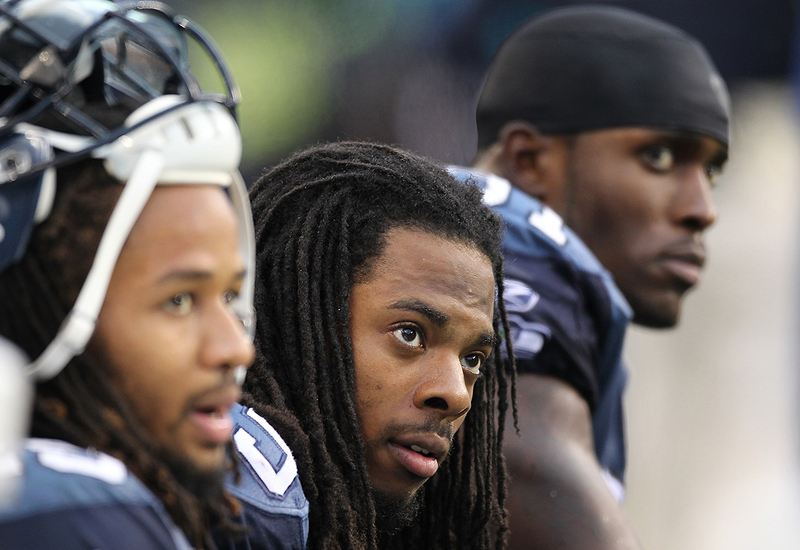 The Seahawks have found undervalued talent — both Sherman and Chancellor were fifth-round picks — and developed it well. The defense is relatively simple, and lined with players perfectly tailored to it. But it’s about more than development and strategy. The Seahawks are scary. That’s what Chancellor provides. He doesn’t like to call it fear. To him, it’s respect. But by any name, it’s real. The hits — and the threat of them — make opponents blink first. For years, Chancellor has been the Seahawks’ muscle, the one who drops the boom that spawned a legion. “But it’s more than that,” says Kris Richard, Seattle’s defensive backs coach. “He’s a shoulder to lean on. He’s an old soul. An old, wise guy who’s got a ton of experience. At what? We don’t know. But you know you can count on him, you can go to him.” A year after Chancellor defined Seattle’s first Super Bowl, he’s at the center of its chase for a second. The man who damages souls gives the Seahawks their own. The Hampton Roads region of Virginia knows high school football. But even by its lofty standards, Phoebus High School carries weight. Wright — a two-way star committed to Virginia Tech — was a senior in 2005 when the Phantoms hosted a regional final against Maury High School. Maury is in Norfolk, about a half hour south across the water, and their quarterback was a 6-foot-3, 210-pound nightmare named Kam Chancellor. As they often did, Phoebus moved the ball at will that night. They scored seven touchdowns and rushed for nearly 300 yards. The problem was that Chancellor refused to fade. He threw for 225, ran for 35 more, and accounted for five touchdowns, all told. It was a blocked extra point that did Maury in, for a 49-48 loss in double overtime. Chancellor didn’t play a lot of defense in those days. He meant far too much to the offense. They held him to 15, 20 snaps a game, his head coach Dealton Cotton remembers now, maybe a few more if they needed a big play. Against Phoebus, one of those snaps came on the final play of the first half. Maury trailed 14-13. The Phantoms had just 16 yards to the end zone and time for a single play. Wright lined up as a tight end to the right, and at the snap, started sprinting down the seam. He caught the pass, but he paid for it. The hit by a seldom-used safety separated his shoulder. It was a bad AC sprain, severe enough to linger a decade later. Matt Wright’s older brother, D.J. 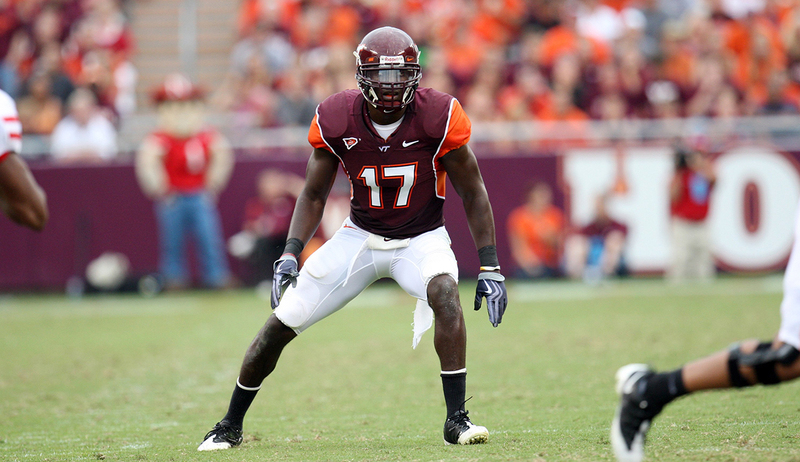 Parker, graduated from Phoebus two years earlier, and by the summer of 2006, he was Virginia Tech’s starting free safety. He remembers that morning, two days into summer practices, when a freshman built like a tight end strolled into the secondary meeting. “He walked into the DB room, and I was like, ‘Man, this dude is huge,’” Parker says. Kam Chancellor came to Tech as a quarterback, but depth issues spurred first-year position coach Torrian Gray to coax him over to the defense. Fellow freshman Zach Luckett joined him. The two stayed after practice that first day, alternating between receiver and cover man. In a dozen throws, Luckett didn’t catch a single pass. The athletic feats showed up everywhere, from the practice field to teamwide dunk contests that featured Chancellor’s head above the rim and the ball going between his legs. But what Parker couldn’t believe was how steady he was, how reliable. Parker was a senior when a 20-year-old Chancellor stepped in next to him at strong safety. Parker never had to tell him what to do or where to be. “I was impressed by that,” Parker says. “Me being a senior and him being a sophomore, I knew I wasn’t going to have to worry about Kam.” Chancellor took over at free safety — the quarterback of Tech’s defense — when Parker graduated. He’d text Parker after games, wondering what he’d done wrong, what he could do better. Each one of his hits is a half-second of chaos, but in his life, Chancellor is about order. He’s meticulous and kempt. He’s been getting manicures for years. “It’s not very often,” he says, “but I need to step it up some more.” In his first job, at age 10, he cleaned at a local barbershop, washing clippers and sweeping hair, to help make a few extra bucks for a single mom who would go on to raise six children by working two or three transportation jobs at a time. “I’m real particular,” Chancellor says. “I’m a timing guy, I’m a schedule guy. Everything has a place, everything has a time. I’m an attention-to-detail guy. I like to see the little things.” The violence in Chancellor’s game may look reckless, but what has allowed him to survive in a league watching over its collisions is being anything but. Karen Lambert’s children are mostly grown now. They come and go from the Chesapeake home her son bought her after getting his new five-year, $35 million contract in the summer of 2013. But even with a houseful of kids, there are times when she can hardly tell if anyone’s home. “I’ll come down and see them, and say, ‘I didn’t even know you were downstairs! I thought you were gone,’” she says. “It’s just that quiet. We’re very laid back. You talk when you have to talk.” Chancellor takes after Mom. During their early days together in Blacksburg, D.J. Parker wondered if he even could talk. Milloy’s departure left an opening at strong safety, but it also created a leadership void in Seattle’s locker room. When Pete Carroll came to Chancellor before that season, he asked his second-year safety to fill both. “After he got going in his first year, we were kind of calling on him to take over, ‘Go ahead,’” Carroll says. Chancellor resisted. He wasn’t ready; he didn’t feel like he’d done enough. Four seasons later, Chancellor has finally — and fully — given Carroll his wish. Red Bryant had been the voice of the Seattle defense for years, but when the 30-year-old Bryant was cut this offseason, the Seahawks voted Chancellor their new defensive captain. For most of the season, Chancellor fit his mother’s description. He talked only when he had to. Michael Bennett handled the pregame oration. But before the Seahawks’ Week 12 game against Arizona, with Seattle coming off a loss in Kansas City that dropped them to 6-4, Bennett asked Chancellor to do what he’d never done before. He started in the locker room, before the Seahawks even took the field. Chancellor walked up to individual players, looked them in the eye, told them to trust their teammates, to play for one another. Marcus Burley landed in Seattle this spring a year removed from being an undrafted cornerback. Within days, a text lit up his phone. It was Chancellor, offering to help with whatever Burley needed. “He didn’t have to do that,” Burley says. “One of the best safeties in the league, he doesn’t have to do that. When it was time to speak to the group, Chancellor unleashed a message that hit just as hard as he ever has. “It was something that the team needed,” linebacker K.J. Wright says. “You just felt what he said. You usually listen to guys, and you hear them, but you felt that one. I believe it’s one of the things that turned our season around.” For the next 60 minutes, Chancellor was a terror, collecting eight tackles and dictating the Seattle defense in a 19-3 drubbing of the Cardinals. The Seahawks haven’t lost since. Chancellor shrugs when asked about it now. He doesn’t know if he would have done it four years ago. He probably wouldn’t have this season if Bennett hadn’t asked. On Sunday, the league’s loudest franchise will follow its quiet captain into the Super Bowl. He doesn’t need to say anything. They always see him coming. The longtime Seahawks defensive end who signed with Jacksonville this offseason.